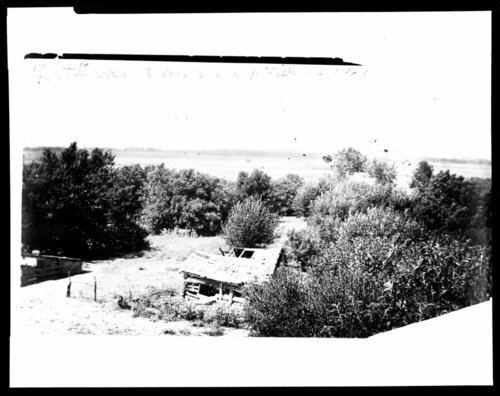 Three photographs showing the remains of Fort Lookout in Republic County, Kansas. This fort was situated upon a high bluff commanding the Republican River valley, and guarded the military road from Fort Riley to Fort Kearney, Nebraska. Unlike the large military posts, it was constructed in the form of a blockhouse. This sturdy two-story log structure performed regular duty until 1868, when it was abandoned by the regular army. State militia used the building during the Indian war of 1868. Following their withdrawal, the old fort was used as a rendezvous for settlers of the White Rock and Republican valleys during the Indian scares of the early 1870's.